There’s a popular public radio program in the United States called All Things Considered; in Australia, a similar program is called Life Matters on the Australia Broadcasting Corporation (ABC) radio station. We were interviewed by Sydney-based program host, Richard Aedy, in the Melbourne station on Tuesday morning prior to our screening at Deakin University. This was our second radio interview, the first being at 3CR Community Radio 855 AM in Melbourne. I think I speak for most people that hearing my own voice played back to me sounds odd. Do radio hosts, such as Richard, who have such soothing and melodic voices, feel the same way? The actual interview will be broadcast next week, and we’ll try to get a podcast or MP3 of the interview that we can link to in this article. Until then, check out the photos from ABC Station! Here are photos from our radio interview on the Life Matters program at ABC Radio. 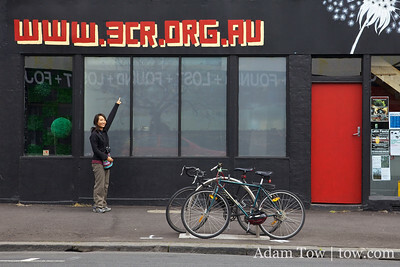 On Saturday, we were interviewed by 3CR Community Radio 855 AM in Melbourne. Peter Krausz and Melinda O’Connor from the Media Moves program interviewed us about Autumn Gem and our upcoming screening tonight at RMIT University. I’ve been interviewed before on radio, but this was Rae’s first time. I thought we did a pretty job, though I’ll have to listen to the podcast to confirm! With one radio interview under our belt, we’re looking forward to our second! Tomorrow morning, we’ll be heading to the Melbourne ABC Radio station for the Life Matters show. We hear that this program is comparable to NPR’s All Things Considered! Here are some photos from our radio interview at 3CR Community Radio 855 AM.